The dangers of cross infection are not only reserved for keyboards? A computer mouse can be used many times by multiple laboratory & medical staff members throughout the working day. SterileMOUSE-WIRELESS-LASER Antibacterial Mouse has a latex free silicone body, laser diode optics, CE approved product that can be washed or wiped with antibacterial/alcohol based agents “Chlor-clean” or equivalent products (often used in hospital environments) thus greatly assisting in reducing cross infections in all clinical areas. 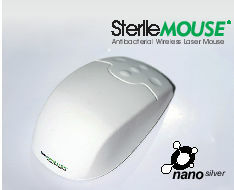 SterileMOUSE-WIRELESS-LASER Antibacterial Mouse is comfortable to use and easy to clean. A stylish design and comfortable shape, rugged and water resistant, made of 100% silicone latex free. Silicon body impregnated with nano silver anti-bacterial component. Rubberised surface for cushioned comfort. Laser Diode Optics. 1200 dpi optical sensor with 3,000 frames per second scan rate. Can be cleaned with antibacterial, alcohol based agents. Can also be cleaned with “Chlor-clean” or equivalent products often used in hospital environments. 2 Command buttons with 3 button scroll wheel function. Compatible. IBM AT, Windows98/2000/XP/Vista/Windows 7/8/10. Dimensions: 114(L) x 65(W) x 41(H) mm. CE Approved, RoHS Compliant Mouse.